In yesterday’s post, I mentioned that the window for a low had just begun to open and that I thought stocks were still on pace to find buyers by the end of next week. The bull seem to have cooperated on the early side of the time range although I am certainly not beating my chest that I called the bottom to the day. Today is month and quarter end so I wouldn’t be surprised to see some “curious” activity, especially this afternoon. I think if the Dow can close above 24,500, especially on a Friday, that would give me some comfort that at least another 1000 points were on the way. 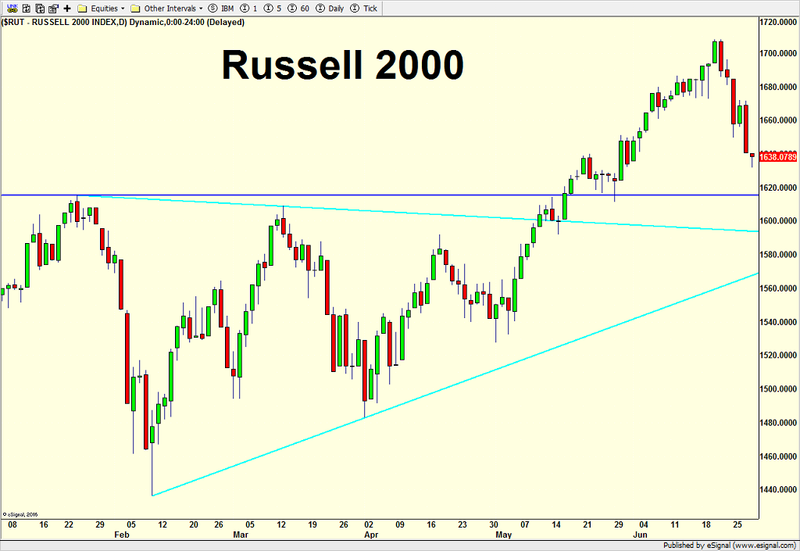 The S&P 400, Russell 2000 and NASDAQ 100 are “supposed” to head back to all-time highs sooner than later if they are going to retain their leadership. Speaking of leadership, I am keenly watching for signs of change over the next week or so. There seems to be movement percolating and it could be substantial. Banks are breathing a sigh of relief after the Fed released the stress tests last night with even Deutsche Bank bouncing. Banks have really disappointed this year and are now being pressured by lower long-term rates and a flattening yield curve. If the sector can somehow ignore these headwinds and head higher, that could the stock market a well needed shot of adrenaline for a big move in Q3. As I wrote twice this week already, I don’t think the pullback was over just yet. My original thought was it was a 5-7 day affair which has a low in place by next week in the 23,500 to 24,000 range for the Dow. The market is entering that zone now and puts today on watch for a bottom if we can get some early selling to be thwarted by mid-afternoon. While the Dow and S&P 500 continue to be the weakest major indices, the S&P 400, Russell 2000 and NASDAQ 100 have seen more straight line declines. All are just about to enter zones where the bulls should begin to fight a little harder. Those three charts are below. 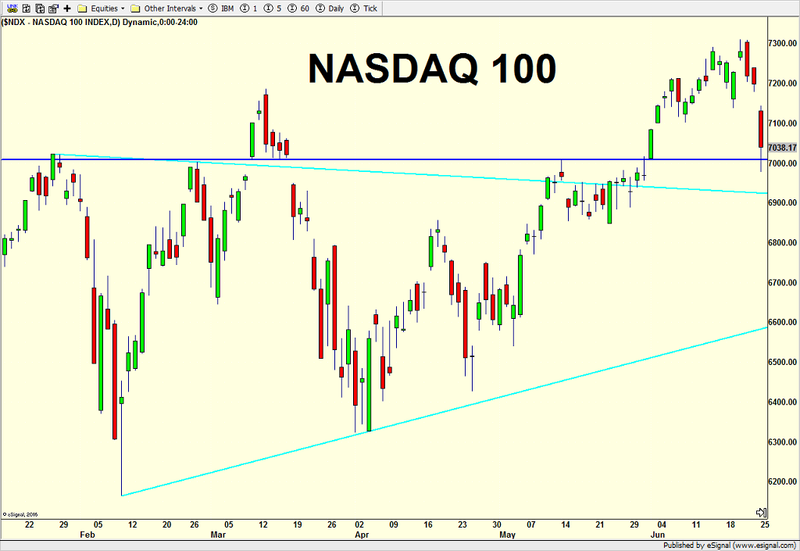 If I had to look at how or why I could be wrong, semis couldn’t make new highs this month when the NASDAQ 100 did. That’s a non-confirmation or negative divergence. Additionally, the decline in the semis has been more severe. 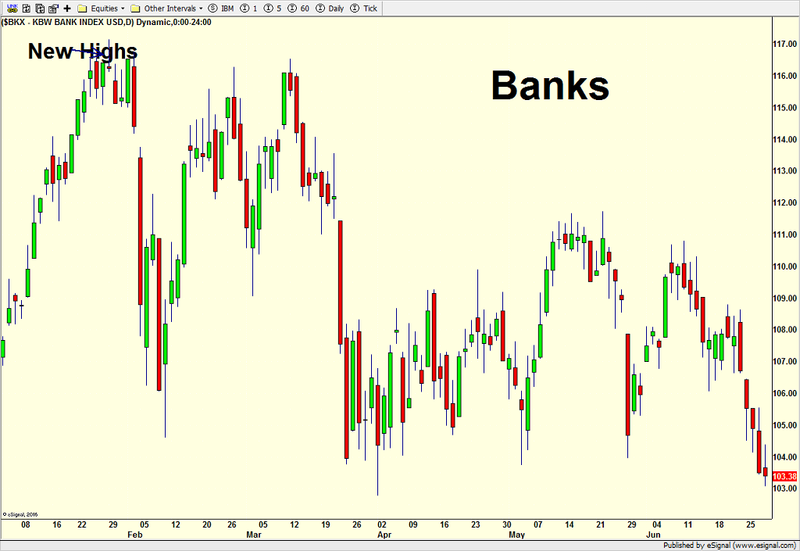 Adding to the semis problems, the banks have really struggled and need to stabilize sooner than later. The stock market is unlikely to mount a significant rally without the banks and the semis together although losing one wouldn’t be the death knell. Let’s see what today holds. Very quietly, utilities have rallied all month and 8 straight days, very much unlike how they behaved during the February decline. With staples and REITs holding their own, it gives me some pause about what I see as very strong economic numbers in Q2 and Q3. Stocks were experiencing a strong selloff on Monday right through lunch. Then Trump trade chief, Peter Navarro, hit the media circuit to “clarify” what was being reported by the Wall Street Journal which was a cessation of Chinese investments into U.S. technology companies. Now normally, Larry Kudlow would have been the administration’s mouthpiece, but he has been recovering from a heart attack. So, the most protectionist person in the administration had to come out as less protectionist. An odd day for sure. Stocks rallied over the final 60+ minutes, mitigating some of the losses. You can see below what looks like the same chart from yesterday. It basically is except that we now have a full day of trading for Monday and it’s clear that the bulls defended the widely watched 200 day moving average which I wrote about on yesterday. Notice that this is third time in 2018 where prices have visited and kissed this line. Again, the line itself has no magic. No mystical powers. It’s just very widely watched and followed. And sometimes, it can become a self-fulfilling prophesy as computer-based algorithms gun for price to move down to the line to entice others to take action. On Monday, the bulls defended that area. Anyway, as I wrote yesterday, I still do not think we have seen the bottom from which prices will rocket to all-time highs. It seems like we need some more work on the downside. While the masses were fretting about the tech bloodbath, I explained on Nightly Business Report last night that there are absolutely no indications that yesterday was anything more than one bad day, certainly not the end of the tech bull market. In fact, as you can see below on the far right of the chart, price just declined to the horizontal blue line which is where bulls and bears fought a number of previous battles during 2018. The pullback doesn’t appear to be over. There could or should be an attempt at a bounce even though the final week of June doesn’t have the greatest track record. If so, watching the sectors that lead will say much about what lies ahead. The signs for Q3 remain very positive. 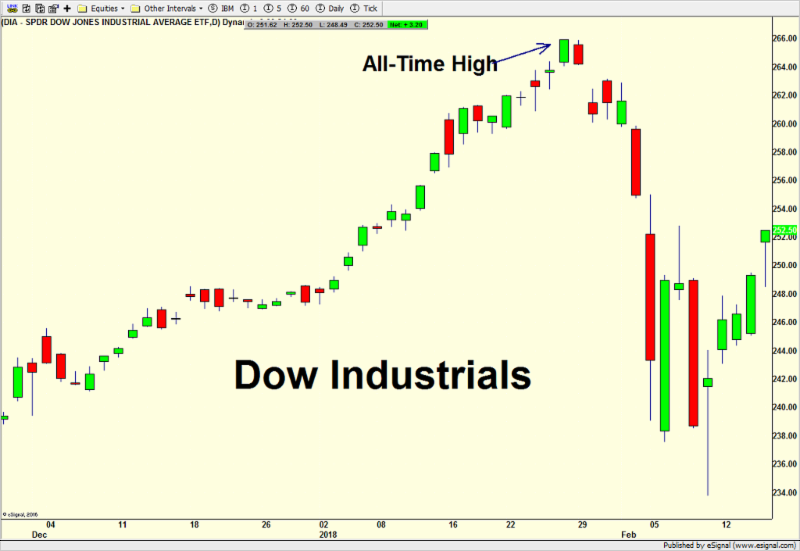 The bulls could barely muster a feeble bounce on Friday, especially after the Dow was down 9 straight days, something that does not occur too often in a bull market. Keep in mind, however, that those 9 down days only amounted to a 3.4% decline which is basically one or two bad days. 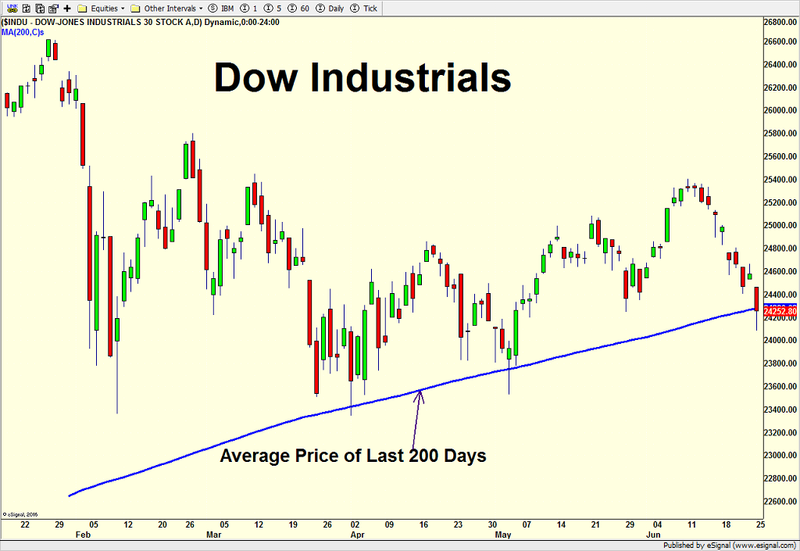 Additionally, as you can see below, the Dow is once again visiting its average price of the last 200 days, more affectionately know as the 200 day moving average. 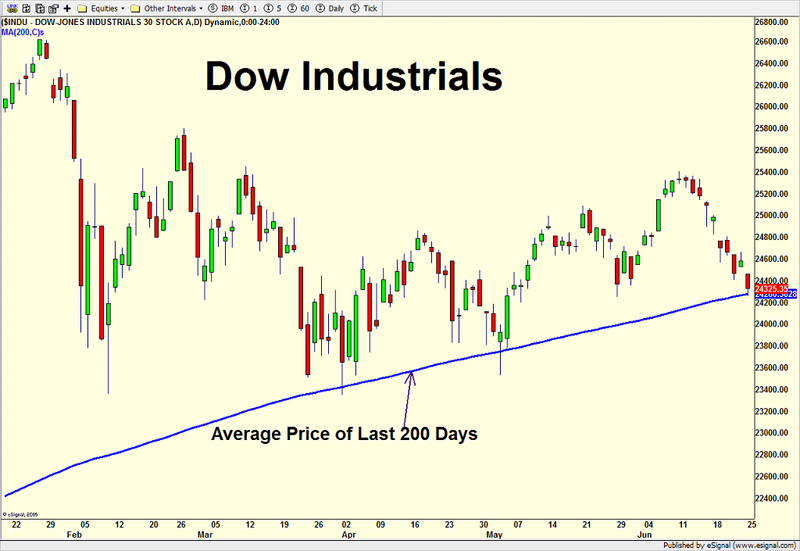 As many of you know, there is nothing magical nor special about the the 200 day moving average except that it is widely watched as a gauge of the long-term trend. This is the third time this year that the Dow is visiting it. The Dow has been the weakest major index and this could be the beginning of the end for that underperformance. Looking at the other four major indices, none of them are even close to their average price of the last 200 days which can be good or bad, but I think good in this case. In the very short-term none of the major indices look to be at their lows just yet and opening indications are for an ugly down start to the new week. Seasonally, this week is negative which continues the trend from last week and right to quarter end on Friday. In all likelihood, stocks should trade lower before they bottom, but there is a good chance to see a low in the next 5-7 trading days. After an ugly opening stocks scratched and clawed to cut their losses on Tuesday, something I did not expect to happen. The bulls’ strength was impressive. I was hoping to see some follow through on Wednesday, but that did not materialize. The Dow Industrials remain the weakest index followed by the S&P 500, S&P 400, NASDAQ 100 and Russell 2000. I was clearly wrong in the glimmer of hope the value sector gave for new leadership. Their leadership will one day come, but not the past few weeks. From a long-term perspective, the NYSE A/D Line continues to look strong and insulate stocks from a bear market, for now. Plainly put, we are seeing good participation in the rally. And as I have mentioned over the past few weeks, junk bonds no longer stink. And believe it or now, they are even exhibiting some leadership characteristics. While TV and the internet may be overwhelmed with negative commentary, things are just fine in the economy and markets. Don’t let the habitually wrong crowd fool you. The bull market remains alive and headed to 27,000 next quarter. 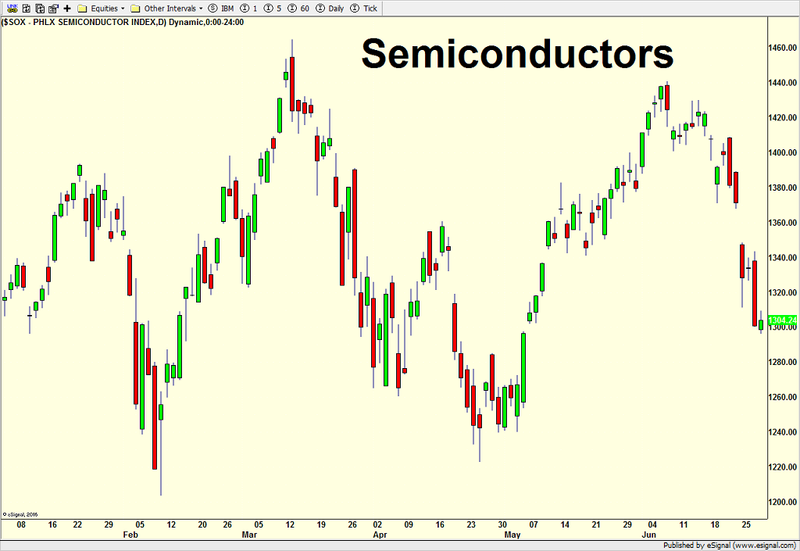 The bulls mustered enough strength on Monday to avoid closing anywhere near last week’s lows. That was mildly impressive. However, the Trump Tariff Tantrum is front and center today as it was on Monday as overnight action looks like a nasty 300+ point decline to begin Tuesday. Unlike yesterday, I will be surprised if the bulls have enough power and ammunition left to thwart the bears. Taking somewhat of a stab in the dark, I would imagine a day where stocks open sharply lower, bounce for an hour or so, establish a range and then sell off again after lunch. If the morning lows are broken, there is potential to see a large down day, somewhere between 500 and 800 points. Obviously, there’s a lot of hyper short-term speculation in there. Again, the bulls would really surprise me if they had enough power to hold the decline to under 150 points on the Dow. I mentioned bonds on Monday and it will be interesting to see if they have enough strength to trade above last week’s high. Yesterday’s action was not that great. IF they can get moving, it’s not out of the question to see the 10 year note yield below 2.80%. Stocks came back from some mild morning weakness on Friday but still look like they want to pause to refresh as the on again, off again continuation of the Trump Tariff Tantrum is front page now. In the very short-term, it’s pretty easy. Closing above last week’s highs gives the bulls energy to move higher. Closing below Friday’s low means stocks could see a mild 2-3% pullback before heading to all-time highs in Q3. The seasonal trends show some weakness ahead as it is the week after option expiration with stocks in an uptrend. I believe the hat tip goes to Rob Hanna of Quantifiable Edges but I am not 100% sure. 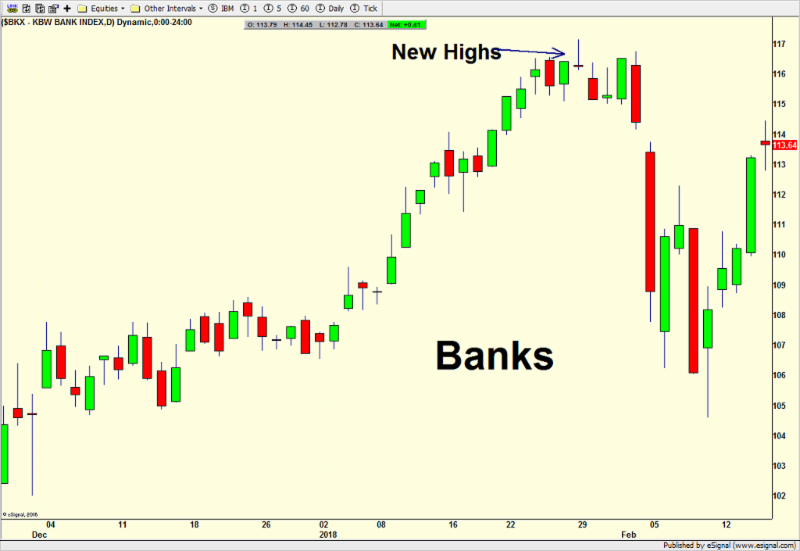 While banks have pulled back and need to stabilize, semis are still okay but really need new highs. I keep writing about transports as they look like the next major sector to take off and lead. That’s still the case as they seem poised to run to new highs. 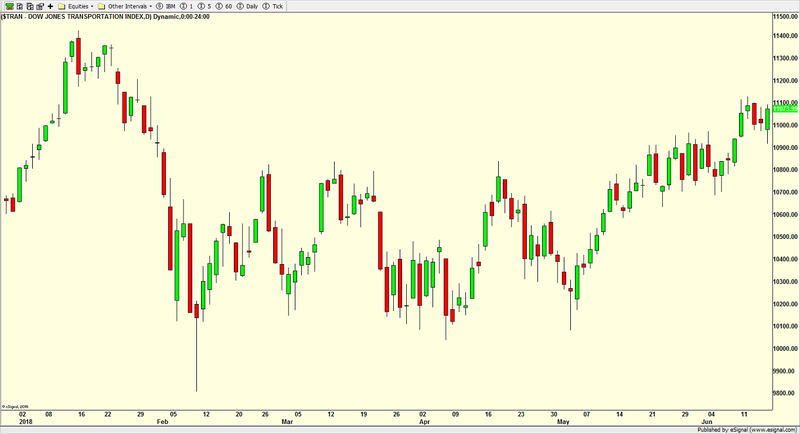 Bonds on the other hand, look like they have a little life, especially if they close above Friday’s high. The more the masses have become aware that rates have gone up so dramatically in absolute terms, the more I have been positive on bonds. While I continue to believe that the 35-year bull market in bonds ended in July 2016, there will be plenty of opportunities on the long side over the coming years and decades. It’s just like with stocks. While they have gone up, up, up for more than 9 years, they have been plenty of times to position for a move in the other direction. On Wednesday with most of our tried and true Fed Day trends muted, I mentioned the possibility for a negative set up. 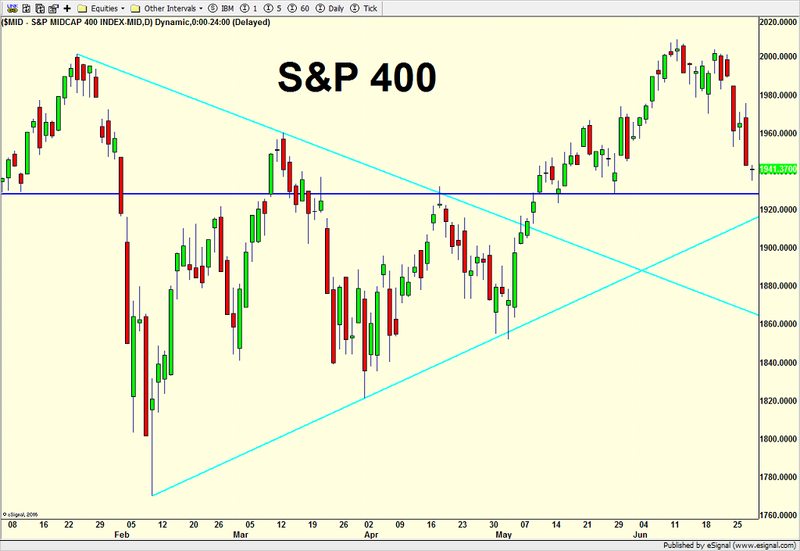 With the S&P 500 down on statement day, that set up a shorting opportunity for yesterday, today and into next week. Nothing big, just some potential mild weakness after a very nice run into the Fed meeting. If any weakness does materialize, it will be interesting to see if tech cedes leadership in favor of value. 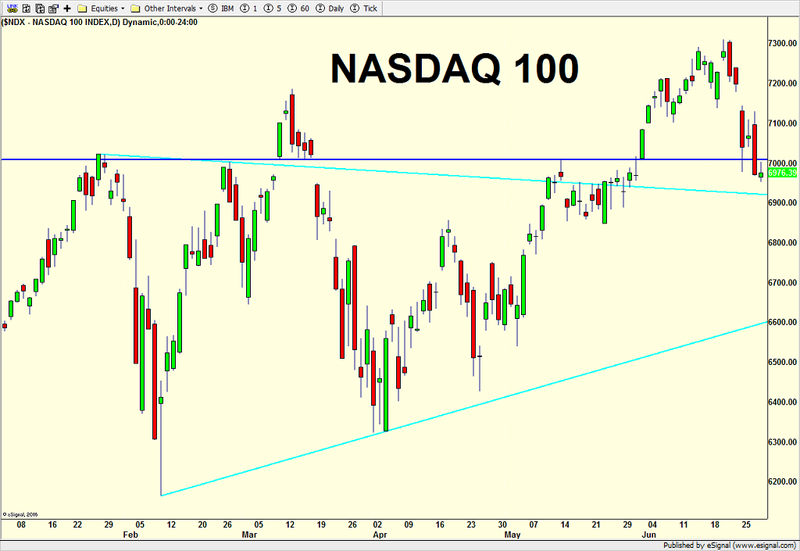 With the NASDAQ 100 it certainly doesn’t appear that way and my call for a change in leadership in favor of value does seem a premature and a bit foolish. Speaking of the NASDAQ 100, I am a little bothered that semis remain below their highs. That needs to be watched closely for signs of a more serious divergence and warning. Investors have been more focused on software and internet which is okay in the short-term. Looking at the other three key sectors, banks remain mired in a trading which I continue to believe will resolve itself to the upside next quarter. 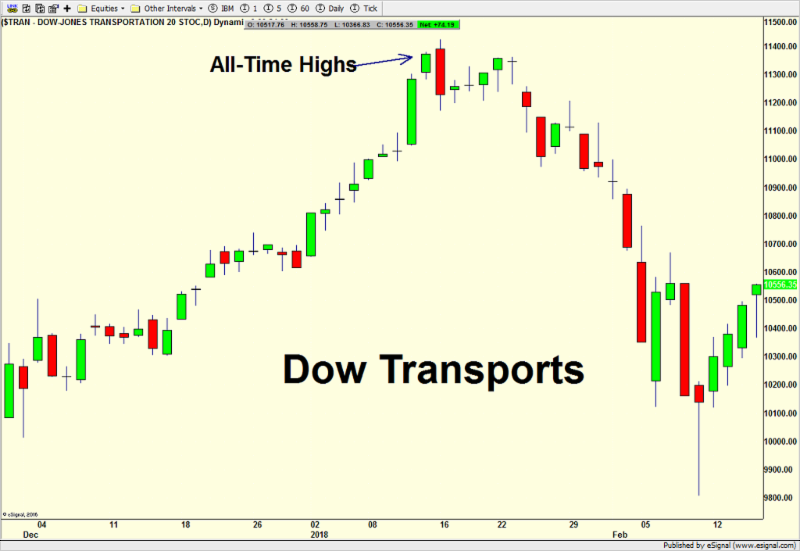 Transports have been strong and leading and should also see all-time highs next quarter. 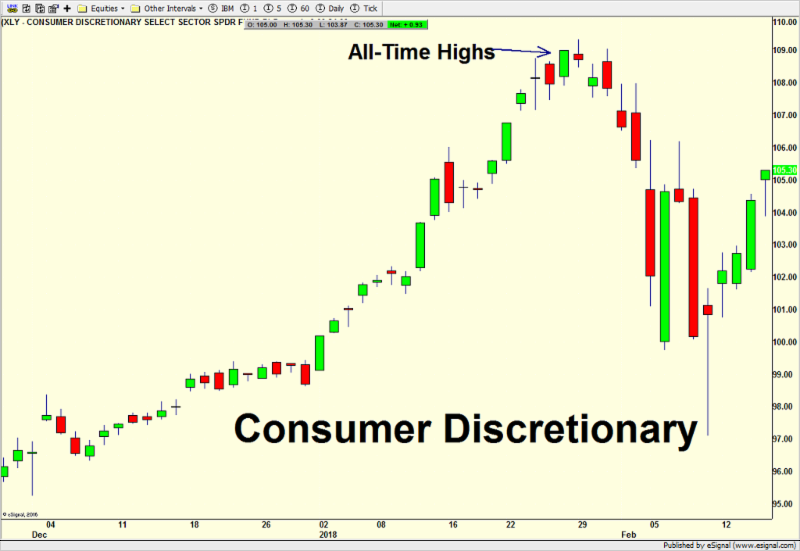 Consumer Discretionary has been the strongest leader over the past 6 weeks, but I would imagine the upside acceleration begins to slow sooner than later. Finally, as I started to mention late last week, high yield bonds no longer stink. They have been kicking it up a notch of late, but still remain nowhere near their 2017 highs. The bottom line. Any short-term weakness should be bought. The final group of canaries don’t have anything in common. I just grouped them together to avoid having three more small canaries. Let’s start with high yield (junk) bonds which I write about very often on the blog. I like to use one of the exchange traded funds (ETF) ones as well as one from the mutual fund space. 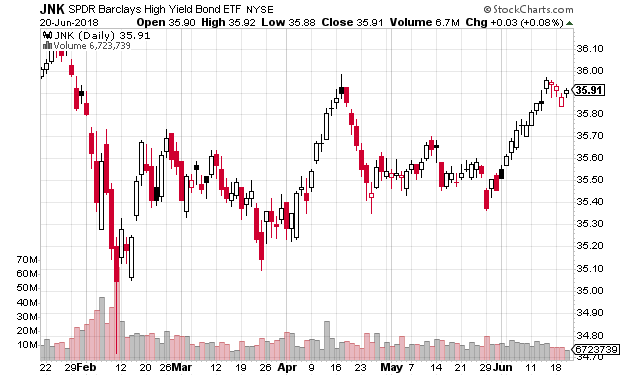 Right below, you can see JNK which is one of the two major high yield bond ETFs. It peaked in early January. Just below that chart, you will find PHYDX which is a PIMCO’s giant high yield mutual fund. It, too, peaked in early January which is technically not so bad, however I am very concerned about the depth of the decline that ensued and high yield’s inability to rally very much since. While I do think high yield will rally this month and into Q3, I believe there is a good chance that the January peak for this all-important canary could mark the bull market high. If that’s the case, the stock market will have lost an important canary for quarters or perhaps even years to come. 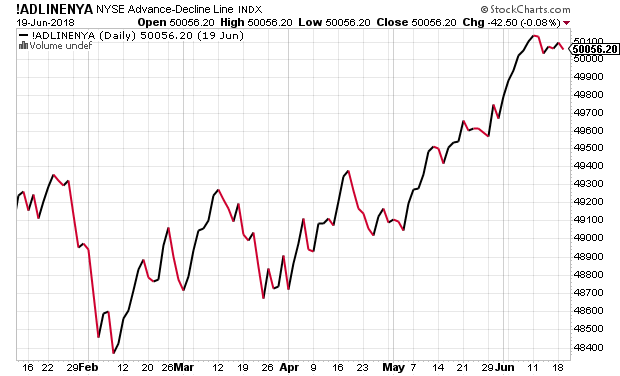 The New York Stock Exchange Advance/Decline Line (NYAD) is next and it is important because it shows the levels of participation in the bull market rally. 90% of all bull markets deaths show a NYAD canary that was dead at least three months before prices started to roll over. In other words, the NYAD is a very good leading indicator that will sometimes give false warnings, but rarely fail to warn. It usually pays to watch for times when stocks are making new highs and this indicator is not. Below you can see that at the January peak, the NYAD was scoring fresh new highs. As has been the theme of this whole issue, this is absolutely not the type of behavior usually seen at bull market peaks. Finally, somewhat similar to the NYAD, we look at the percent of stocks above their average price of the last 200 days. Bull market typically end with significant weakness beneath the surface over the long-term. That means the line below should be going down well before price see their final highs and the number should certainly be less than 60%. At the January stock market peak, 75% of stocks were trading above their 200 day long-term trend. Summing it all up, as has been the case during every single stock market pullback and correction since the bull market launched in March 2009, the bearish pundits have been dead wrong. The preponderance of the evidence strongly suggests new highs for the stock market which I have been forecasting all year, above Dow 27,000. I still have an upside projection to Dow 30,000. Let’s turn to the next group of canaries and see how our sectors were doing at the January peak. First, I am repeating the Dow Industrials with the Dow Transports right below it to show Dow Theory which says that these two indices should be making highs together or a warning is sent. While both indices saw all-time highs in January, you may observe that they were on the same day or even week. That would not be a warning or cause for concern unless more time elapsed in between. Seeing that the Dow Transports did make an all-time high in January, let’s turn to the other key sector canaries. 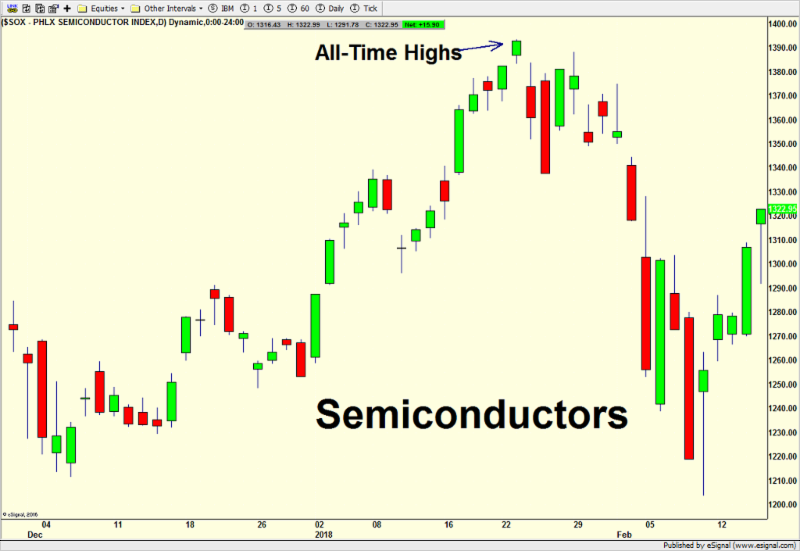 As you can see below, the banks, semiconductors and consumer discretionary all made new highs in January. Again, this is absolutely not the type of behavior typically seen at the end of bull markets.